There have been multiple sightings of dragons on the north and eastern side of the island. Across the lake, fishermen have reported lights and activity near the tower. Thaedon takes Iria and Aerys to go pay a visit to the Historian, who’s going to come to us in a week. We go speak with Kazbika next, and Thae breaks the news to her diplomatically that slavery will not be tolerated within the Principality of Ravenwind. Then we go to Parth to speak with Baroness Ludmilla v. Parth du Arc to give her the 411 about dragons, refugees, et al. and garner advice on how to best supply, support, and deal with them. She tells us that there is a humanoid army developing in the mountains of western Canistan. The Royal Huntsmen have been keeping an eye on that. Her son Eris and his people are going to go to the refugees in a few days to keep a wrap on that. The next day, we are visited by Sister Finnen, a member of the Order of the Billets of St Cuthbert. She wants to rebuild the school of St Cuthbert in Rabat. They are set up to teach the youth. With Thaedon’s agreement, they’ll be there within a month. We go back to Rabat. Quellan reappears at Port Vigil and works with Ben and Halfdan to excavate the harbor. The Historian comes to give us a History Lesson about the island. He is a human male in late 50s/early 60s, in decent shape. His clothes are exceptional, and he is wearing two rings of noticeable size and a triangular black amber rod that he uses like a teacher’s pointer. He asks if we know who the original inhabitants of this world were. In the beginning of time, before the ascent of the elves, and dwarves, and humankind, dragons held sway. Their mortal enemies were creatures that are not easy to look upon. Most call them Aberrations (Aboleths, etc). The Aboleths decided to use other species to fight against the dragons (the original slavemasters). The dragons, despite their alignments, united against the Aboleth. Here, and areas to the west, are in an area that was greatly dominated by the Aberrations. Some of the land was once below the sea, and some were above it and sank beneath the waves. Elves and Humans here were remnants of the original slaves. It was all so long ago, that there’s no way to guestimate how long ago. One living being on this planet may have been around, an elf. The dragons also kept humans, elves, and dwarves as slaves. The Aberrations also controlled the Lizard Kingdoms, which eventually took over from there. 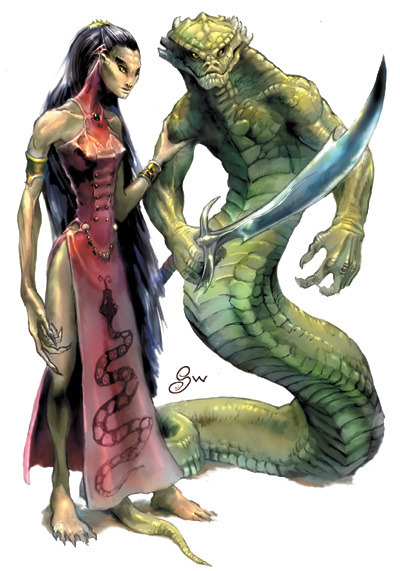 They were split into the Lizards and the Snakes (Yuan-ti), and the strength of the elves were in their glory and pushed them aside and allowed for the rise of man. There is an artifact of that era on this island (the contraption we found near the green dragons north of the Eton Wood.) He asks Aerys if he recognizes the black rod and tosses it to him. Aerys recognizes it as Yuanti work. He tells us it’s some type of device, and that rod may be the key to the device on the island. It may also open other portals around the world. The rod (key) was created during the time of Humanity’s ascent. The lock is considerably older. It may be of aberrant craft and archanomancy. Historian believes that the Yuanti were forced to craft it. Beltar (Suel deity of malice and the pits), Syrul (suel deity of lies, deceit and false promises), and Pyramis (Suel god of assassins, fire, poison and murder). There is no evidence that this rod was created specifically for this device. There are 3 functions of the device. One: Portal Transport – Trigger word is “Beltar’s House” in any language. The 3 triangle prongs extend and when used in the portal: Neutral (closed – Left) and right –open. Historian believes it goes to the legendary prison of Shurell. “The Kiss of Pyramis” creates a rod of tentacles, like the drow use. “The mouth of Syrul” = immune to detect lie for 10 minutes, even if being scanned or under zone of truth. Shurell was an ancient prison created by the Aberrations to control/imprison Dragons. If it’s stuck in the Neutral Position, something is calling Dragons to the location. And Historian believes that even if we close it, The dragons already know the prison is there, and have communicated that to other dragons.